Check Out Our Concrete Services! Arbors and pergolas add vertical beauty and enclose a space for privacy, define an entryway, and add garden character. Arbors and pergolas can make the outdoors an inviting, shady place to spend time in the midst of the summer heat. 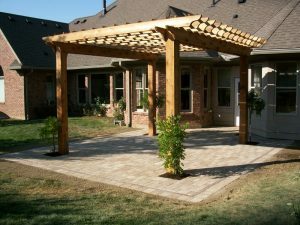 Dean’s Landscaping offers custom built pergolas and arbors. Whether you prefer treated lumber or cedar we have a shade solution for you. We would like to thank you and your crew for the great work you did installing the concrete & landscaping our back yard. The sod looks even better than the rest of the lawn! Thanks for the outstanding job! Let’s get started on your outdoor structure.